A dose of butterfly should sweeten the day, no matter what lies ahead. 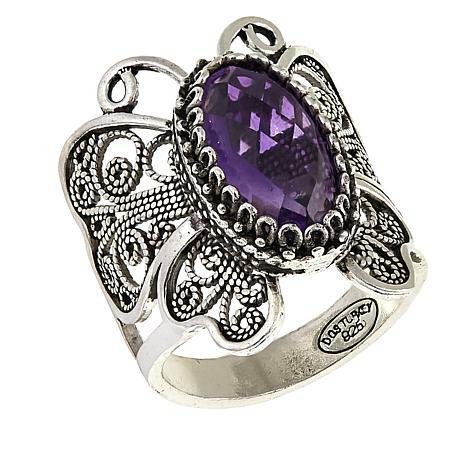 Whether you need a feminine infusion of color to bring life back to your wardrobe or need some wings to carry you away on another fashion adventure, this amethyst and filigree butterfly ring is the remedy. 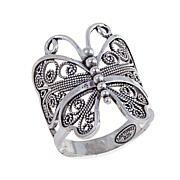 Beautiful delicate looking ring. 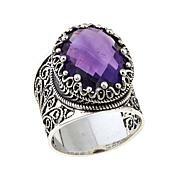 Lovely shade of Amethyst and the ring is true to size. I ordered size 5 and it fits perfectly.Love the silver work on it. I only wish it had a wide band under the finger. I love wide bands and they stay put on your finger. With the narrow band the ring tends to slip sideways. But that's just me.I love the ring and recommend it. 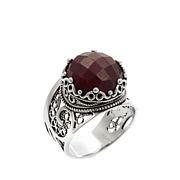 I originally purchased this ring for myself. I was hoping the amethyst was the darker African amethyst but this is a much lighter color. That being said the detail work is beautiful and it is a low silhouette on the hand. I was sitting on the fence as to whether or not to keep it and my butterfly loving best friend fell in love with it so it became her birthday present. 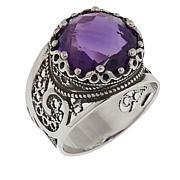 Purchased the Ottoman Silver 3 ct Amethyst Butterfly Filigree Ring recently and love it. It is so delicate and pretty on my finger. Amethyst is one of my favorite stones, also, my daughters absolute favorite. It has a rich color and just what I liked.